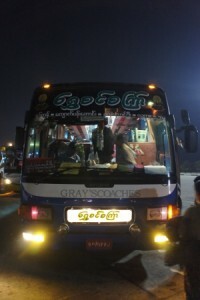 We took the night bus from Yangon to Bagan; about a 10 hour trip. Myanmar is designed in an interesting way. Most of the country is off limits to tourists, and all of the bus stations and airports are well outside the cities. We took a city bus to the bus station,which was a 2 hour journey. At the bus station we met an over zealous Burmese man who wanted to practice his english so he followed us around for 3 hours while we waited for our bus. He loved my glasses, so I let him wear them for a photoshoot. We stopped for dinner along the way. There were probably 300 people at the bus station restaurants. We were the only westerners. The waitstaff were excited to practice their english and helped us order our dinner. They even brought us out some veggie platters; compliments of the house. We were treated like guests in someone’s home. We arrived into a fog covered Bagan at 4 am. I prearranged a shuttle from our hotel so we were looking through the haze trying to spot our names. A cheerful man approached us and said “you must be Ben.” We were the only white people on the bus so we were easy to spot. He led us to the hotel shuttle. Here is a picture. My jaw dropped, I pinched myself to make sure I wasn’t still asleep on the bus. A horse carriage? What? This wasn’t a “lets ride around central park for the novelty of it” horse carriage ride. This was a “here’s what I drive everyday to work” horse carriage ride. 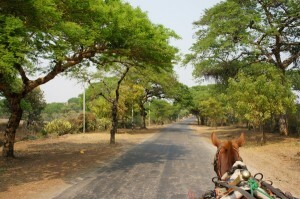 It almost seemed a dream as we trotted through the foggy streets of Bagan to our hotel. Leah and I looked at each other like we had just walked into the wardrobe. So to speak. We stayed at the Eden Motel and the staff were amazing! We arrived extra early in the morning, but they didn’t charge us an additional night. We checked in, had a quick kip and headed off for breakfast. Here is the view of the town from the rooftop terrace where we had breakfast. Ox carts! everywhere. I just walked to the edge of the terrace and took this picture. I didn’t wait for ox carts or men in full length skirts to appear. That is what you see when you look over the edge. You might see a guy riding a bicycle with 50 chickens tied to it. Or a lady carrying a huge flower basket on her head, or maybe 3 horse carriages. One thing is certain: When you look over the edge of the terrace, you know you are in Myanmar. We opted for a horse carriage ride around Bagan. We wanted to visit many pagodas, and this seemed the easiest way. 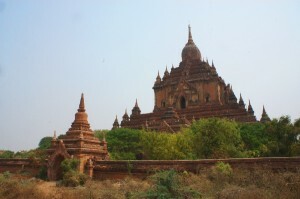 In Bagan there are stupas. Thousands and thousands of stupas. Over 4000 in total! Many of the smaller ones are carried for by families. They live in or near the stupa and maintain it. They raise funds for maintaining the stupa by selling artwork or tours to visitors. The first stupa we visited was under renovation. Here is one home next to a medium size stupa. A lady is preparing lunch inside. Many people were offering sand art for sale. The paintings are mostly screen prints, with some brush painting on top. The designs are pretty good, and the prices are low. Leah and I bought a painting. 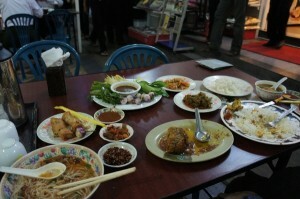 It’s good to spread the wealth as much as possible while traveling, and especially in Burma . We bought a nice painting for $10, many people bargained, and we could have probably bought it for $5. In Thailand, where a thousand tourists walk past the same stalls all day long, bargaining is a fun exchange, a part of the purchasing experience. Here, a dollar saved for me, is a meal lost for the vendor. Kids were trying to sell us trinkets, and when we weren’t interested in buying them, they tried to trade them for our shoes, watches, and shirts. Many times when we visited a stupa, we would have a self-made tour guide follow us around. They’d tell us about the temple, point out other temples in the area and chit chat a bit. Here’s a pic of Leah and a tour guide having a chat on top of the temple. Ok, back to the stupas. There were stupas in every direction! thousands. You couldn’t throw a rock without hitting a stupa. Some of the stupas were as small as a car, others were enormous. I’ve heard building stupas is a way of building good karma points in the Burmese culture. Which could explain why there are so many stupas. 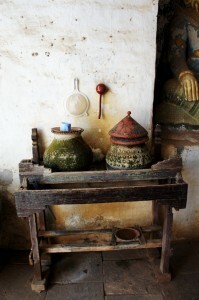 Water pots outside of each temple. 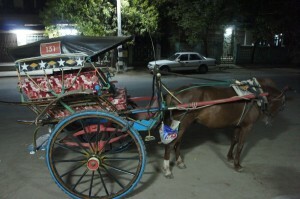 You can’t turn a corner in your horse carriage without seeing something crazy in Bagan. For instance check out this bus! When I took this picture they weren’t done loading. If I had stayed longer, I would have seen then trim the tree to make more room. This bus will not be full until 40 people hop in the back, and they strap a cage with 3 hogs on the tailgate. I had a good chat with our horse carriage driver. His father was a horse carriage driver and showed him the ropes. His dad passed away a couple of years ago and now he is in charge of taking care of the family. His brother works in the town as well. They both support their sister who is studying law in Mandalay. 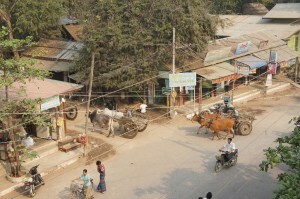 This seems to be a very common occurance in Burma. There isn’t enough money to pay for school for all the children, so the smartest goes to college and the rest support their sibling. It’s remarkable to see, and another remarkable thing is the sibling can be male or female. Education and employment seems possible for women here, something rarely seen in poor countries. 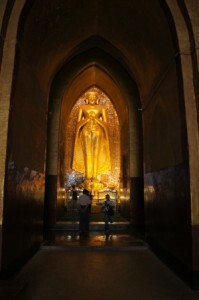 Some stupas had huge buddha inside. What a day of touring stupas. 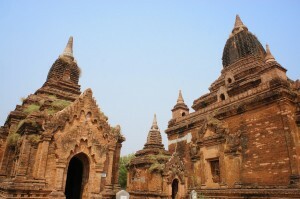 We saw quite a few, and you could spend a lifetime and not see all of the stupas in Bagan. It was a day full of highs and lows. The beauty of Bagan is undescribable, but the way of life here is also undescribable. 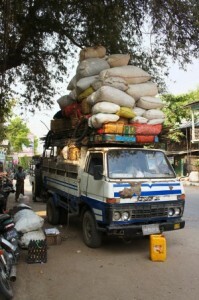 It is a grab bag full of emotions on any tour in Burma. You see the splendor of thousands of stupas scattered throughout the city on one hand, and you see 10 cars in the whole city on the other. And of those 10 cars not one was made after I was born. Monks will get alms in the morning, and if you look hungry, they will give you their food for the day. They have a saying “Nobody will ever go hungry in Burma.” And I whole heartly believe it true. People pull together here, and it’s inspiring. If you every lose faith in humanity. Take a trip to Burma. I just found your blog through Maybe Baby, Maybe Not. Fantastic! I’m thinking of going to Burma at the end of the year so wrapped to read this post about Burma – give me more on Burma please…. Hi! Great you found us. 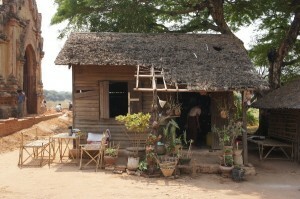 We have a couple more blogs coming on Burma. IF you are thinking of going, we highly recommend it. It’s definitely an exciting place. If you go, try to travel independently there. 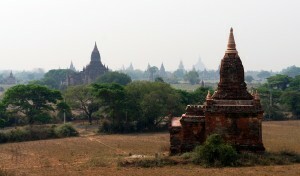 Highlights for us were Bagan, Ancient cities around Mandalay, and a 3 day hike to Inle. Hike to Inle was complete with homestays on the countryside, enormous trees, ox carts around every corner, friendly school children, and jaw dropping views. My email is wolfgramb@gmail.com if you want more information!